The Governor of Indiana is the chief executive of the U.S. state of Indiana. The governor is the head of the executive branch of Indiana's state government and is charged with enforcing state laws. While a territory, Indiana had two governors appointed by the President of the United States. Since statehood in 1816, it has had 49 governors, serving 51 distinct terms; Isaac P. Gray and Henry F. Schricker are the only governors to have served non-consecutive terms. Four governors have served two four-year terms; territorial governor William Henry Harrison served for over 12 years. The shortest-serving governor is Henry Smith Lane, who served two days before resigning to become a U.S. Senator. The current governor is Eric Holcomb, who took office on January 9, 2017. Indiana Territory was formed on July 4, 1800, from the Northwest Territory. Despite remaining a territory for nearly 16 years, it had only two governors appointed by the President of the United States before it became a state. Indiana was admitted to the Union on December 11, 1816. The original 1816 Constitution of Indiana provided for the election of a governor and a lieutenant governor every three years, limited to six years out of any nine-year period. The second and current constitution of 1851 lengthened terms to four years and set the commencement of the governor's term on the second Monday in the January following the election. Governors were allowed to serve for four years in any eight-year period, but a 1972 amendment permitted governors to serve for eight years in any twelve-year period. Should the office of governor become vacant, the lieutenant governor becomes governor. If the office of lieutenant governor is vacant, the president pro tempore of the Indiana Senate becomes governor; this has happened once, when James B. Ray succeeded William Hendricks. ^ John Gibson is sometimes known as Indiana's second territorial governor. He actually only served as acting governor of the Indiana Territory during the absences of Governor William Henry Harrison. ^ The official site labels Eric Holcomb as the 51st governor; based on this, repeat non-consecutive terms are numbered. ^ Does not include acting lieutenant governors. All lieutenant governors represented the same party as their governor. ^ Jennings resigned to take an elected seat in the United States House of Representatives. ^ Jennings was appointed a United States commissioner to conclude a treaty with native tribes on April 15, 1818; after this time, Harrison was acting as governor. However, by accepting the post, Harrison believed Jennings had vacated the seat, and thus felt he had succeeded Jennings to the governorship. The state legislature declined to confirm this, and Harrison resigned on December 18, 1818. ^ Hendricks resigned to take an elected seat in the United States Senate. ^ As the office of lieutenant governor was vacant, Ray, as president pro tempore of the senate, succeeded Hendricks. ^ Whitcomb resigned to take an elected seat in the United States Senate. ^ First term under the 1851 constitution, which lengthened terms to four years. ^ Lane resigned to take an elected seat in the United States Senate. ^ Morton resigned to take an elected seat in the United States Senate. ^ Baker acted as governor from October 1865 to March 1866 while Morton sought treatment for a stroke and handed over executive powers. ^ McCray resigned following his conviction for mail fraud, and served three years in prison until he was pardoned by President Herbert Hoover. ^ It is unknown if the 1972 constitutional amendment allowing for a second term would have impacted Whitcomb; either way, he did not run in the 1972 election. 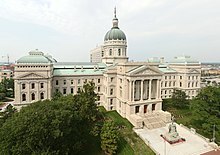 ^ Holcomb's first term expires on January 11, 2021. Indiana Historical Bureau. "Lieutenant Governors". State of Indiana. Retrieved May 27, 2008. "Indiana Governors". National Governors Association. Archived from the original on February 4, 2009. Retrieved December 6, 2008. McLauchlan, William P. (1996). The Indiana State Constitution. Greenwood Publishing Group. ISBN 0-313-29208-6. "Previous Governors". State of Indiana. Archived from the original on December 1, 2008. Retrieved December 6, 2008. Year Book of the State of Indiana. 1919. "Constitution of the State of Indiana". Indiana Legislature. Retrieved December 8, 2008. "1816 Constitution of the State of Indiana". State of Indian. Retrieved July 13, 2010. "1851 Constitution of the State of Indiana". Indiana Historical Bureau. Retrieved December 8, 2008. ^ "John Gibson Letters". Indiana State Library. Archived from the original on December 2, 2008. Retrieved December 6, 2008. ^ "About the Governor". State of Indiana. Retrieved November 17, 2018. ^ "Indiana Governor Conrad Baker". National Governors Association. Archived from the original on January 4, 2010. Retrieved July 13, 2010. ^ "Warren Terry McCray". Indiana Historical Bureau. Archived from the original on November 16, 2008. Retrieved December 6, 2008.